Victoria Junior School, which was recently demolished after being plagued with methane gas pollution for many years. Victoria School stands on the site of old coal workings, probably those of Ann Pit (roughly where Douglas Road is now) and Charles Pit (on the SW side of Harrington Road Cemetery). This school has now been replaced with a modern building on the same site. 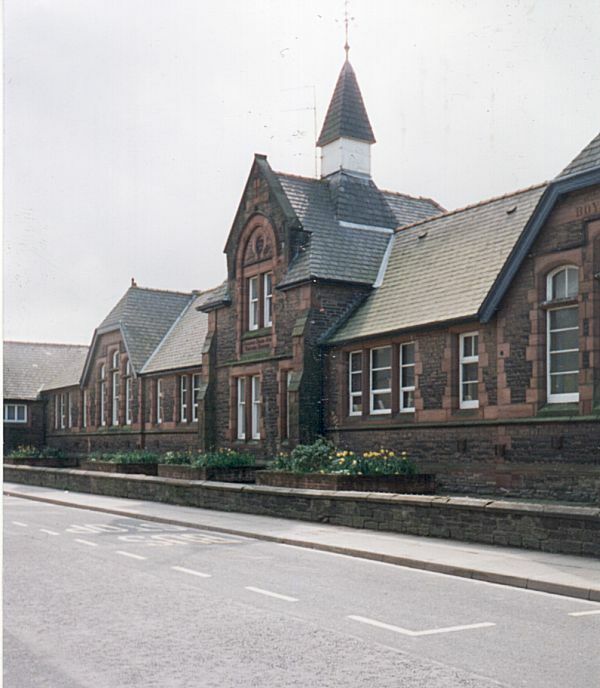 Victoria School was built in 1884/5, being designed by local architect, George Oliver. Note the evidence of segregation: The inscription "BOYS" can be made out to the RHS of the above photograph. The Girls' side was left of the central section. This centre section was originally a private house, built as part of the school to accommodate the Head Teacher. The front door to it (right-hand side) had long-since been converted to a window. The images below (which - when clicked on will link to a larger image) show the view from the playground, with the "Silver Star" Chinese takeaway to the extreme RHS, and the view looking down Victoria Road. For a short period around the early 1960's, Victoria School became a Girl's Secondary Modern School. It was not possible to sit GCEs, though; these had to be taken at other secondary schools in the area.